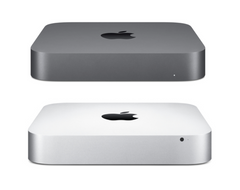 Les ordinateurs Mac® mini constituent des serveurs parfaits pour la plupart des applications. Cependant, leur intégration dans un rack pose certains problèmes. Comment fixez-vous en toute sécurité les minis? Comment les gardez-vous au frais? Comment les allumer sans les sortir du rack? Comment connecter une clé USB pour une mise à jour rapide? 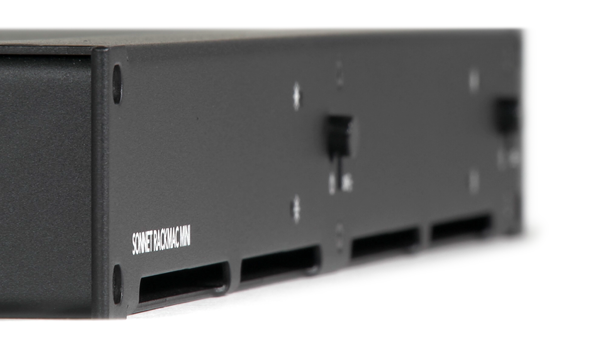 Le RackMac™ mini de Sonnet résout tous ces problèmes et bien plus encore. Cette solution de montage en rack intégré permet l'installation d'un ou deux ordinateurs Mac® mini côte à côte dans un espace rack de 1U. Construit en acier robuste, le RackMac mini place les ordinateurs derrière une facade avant intelligente. La conception du châssis gère la circulation de l’air vers les ordinateurs afin de les maintenir aussi frais que l’air ambiant : placez les côte à côte et empilez-les et empilez-les en hauteur pour une ferme de serveurs Mac mini. Le RackMac mini fournit un commutateur d'alimentation et un port USB 3.0 en façade avant pour chaque ordinateur ; des câbles intégrés relient les ports aux ports USB de votre ordinateur. Présenté sans couvercle ; les ordinateurs Mac mini présentés ne sont pas inclus. Mac minis are great general-purpose computers, and make sweet servers for many applications. However, integrating them into a rack poses some challenges. How do you securely mount the minis? How do you keep them cool? How do you turn them on without pulling them out of the rack? How do you plug in a thumb drive for a quick update? 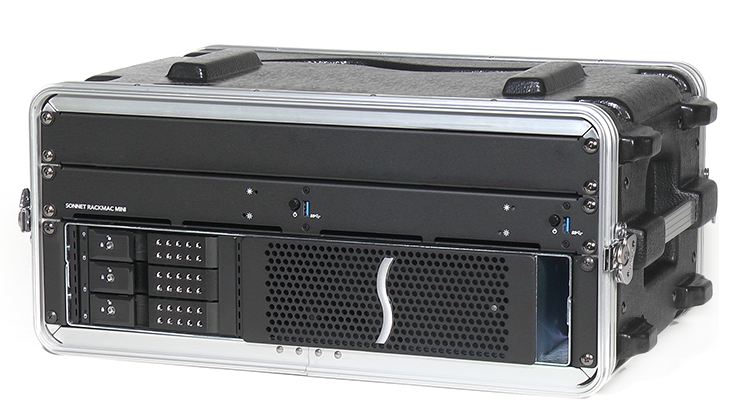 Sonnet’s RackMac mini solves all these challenges and more! 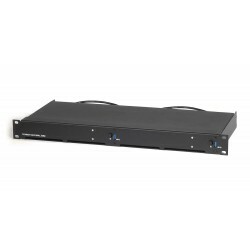 Constructed of rugged steel, the RackMac mini is a fully-assembled rackmount solution that supports one or two Mac mini® computers installed side-by-side into 1U of rack space, placing the computers behind a neat front panel. The enclosure’s design—updated to properly support 2018 6-core Mac mini models—manages airflow through the computers to keep them as cool as ambient air in the rack as on a desk, enabling you to stack them close and stack them high for a Mac mini server farm. The RackMac mini provides front panel access to each Mac mini’s power switch and one of its USB-A ports, enabling you to switch each computer on and off, and connect a keyboard, mouse, USB drive, or other USB device. Do you need to take your mini on the road? The RackMac mini is a perfect travel solution. Its 8.25-inch mounting depth, plus firm rubber cushions that securely hold your computers in place during transport, make RackMac mini ideal for use in molded cases such as those from Gator Cases. The RackMac mini’s design also allows normal WiFi and Bluetooth wireless operation in most configurations (depending on rack type and position in rack), so you can use iOS® device control apps. RackMac mini provides open access to your computers’ ports at the back of the enclosure. RackMac mini secures your Mac minis without trapping them in recirculating hot rack air. A strategically designed chamber directs cool air in a one-way path through front panel openings—now twice the air space to provide proper thermal support for the latest Mac mini—to the computers’ air intakes, and then out the back. RackMac mini’s design ensures that cool air goes in a one-way path through the front panel openings to the computers’ air intakes, exiting out the rear. In a single Mac mini configuration, the Sonnet solution’s air dam and strategically placed seals help keep air from circulating in the unoccupied computer bay. Whether you install one or two Mac minis, RackMac mini prevents recirculation of hot air around the computers to keep them ambient temperature chill and operating reliably. The updated RackMac mini includes dual power/status indicator openings for each computer, allowing its light to shine through whether you’ve installed an older model or the latest. Spécifications sujettes à modifications sans préavis .